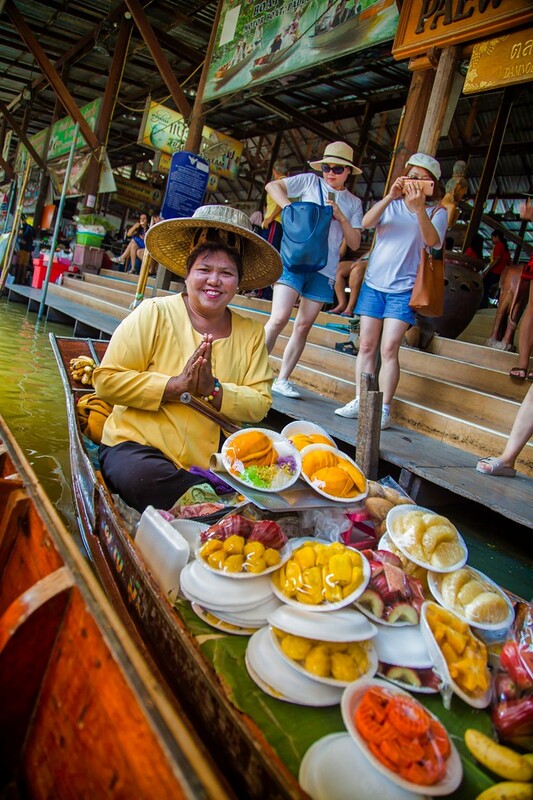 It’s not my first time at a Thai floating market, but every time I visit Thailand with family or with friends who haven’t been before, I try to follow their itinerary even if I’ve seen it before. 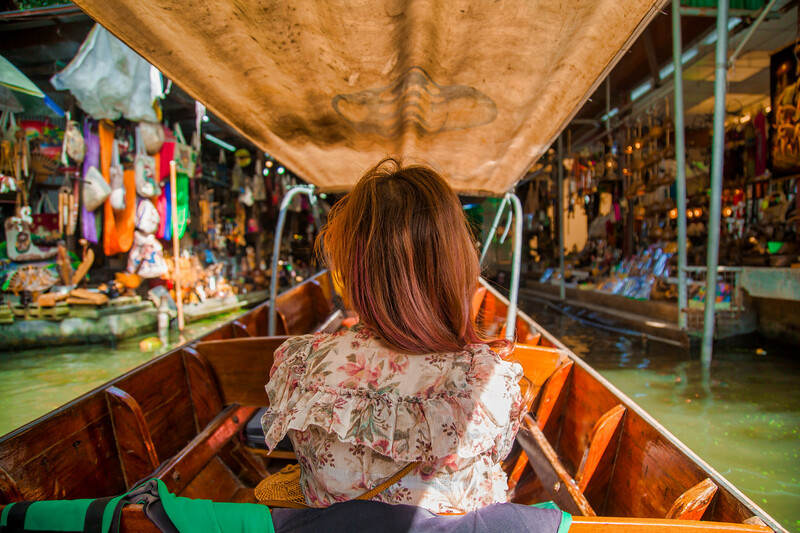 Amphawa floating market is a two-hour car ride away (without factoring traffic jams). It only opens from Friday to Sunday, and if you are not an early riser, you’ll be glad to note that the market only opens after 2 pm. 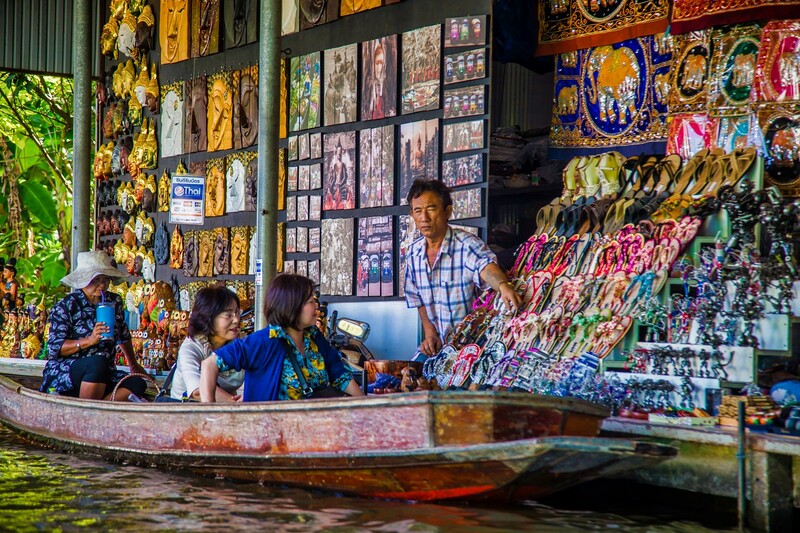 While floating markets used to be a way of life for the riverside communities in Thailand, these days, it’s more of a tourist attraction. 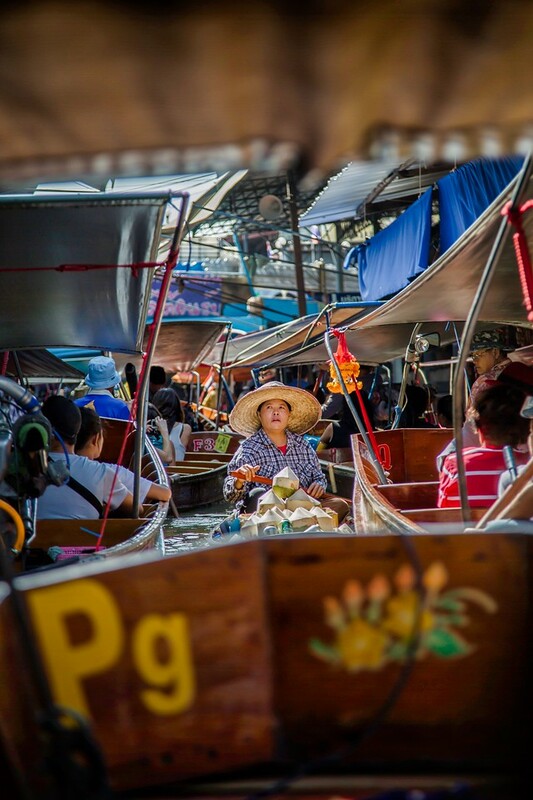 I enjoyed taking a private longtail boat around the Amphawa floating market, starting from quieter canals (there are about 300 different canals) before merging into the insanely crowded “main street” canal of the market. This is when things get a little slow. It’s like being back in the infamous Bangkok traffic except it’s on the water. However, there are lots of sights to see and photograph. 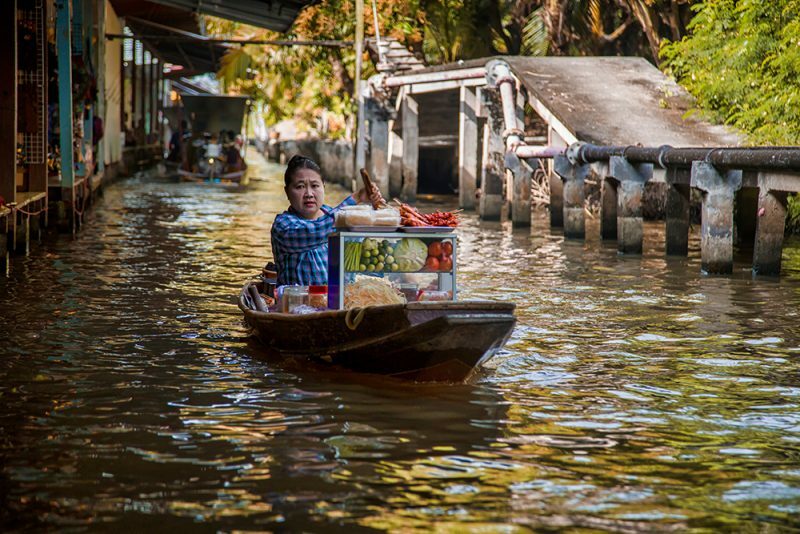 You can shop for souvenirs or lunch right from your boat. Our boatman was an excellent navigator and could get from one side of the river easily despite the congestion. I ordered a delicious basil pork rice with a fried egg from one of the vendor and finished off with mango sticky rice dessert from another. It is impressive to see how some of the vendors do live cooking of their hot dishes in their tiny little boats. You can also choose to dock the boat and explore the marketplace by foot. It’s a fun way to soak up the atmosphere and enjoy the vibrant market. I heard that the seafood here is excellent though I didn’t try it this trip. Evening trips to see fireflies are also available, but we were worn out from the intense humidity of Thailand’s afternoon weather and decided to head back to Bangkok instead. I really love exploring what Thailand has to offer! 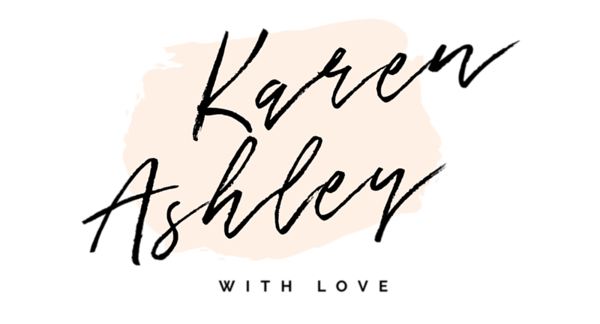 Thanks for reading and I’ll share more snippets of my travel with you soon! It’s definitely a fun thing to try if you visit Thailand. 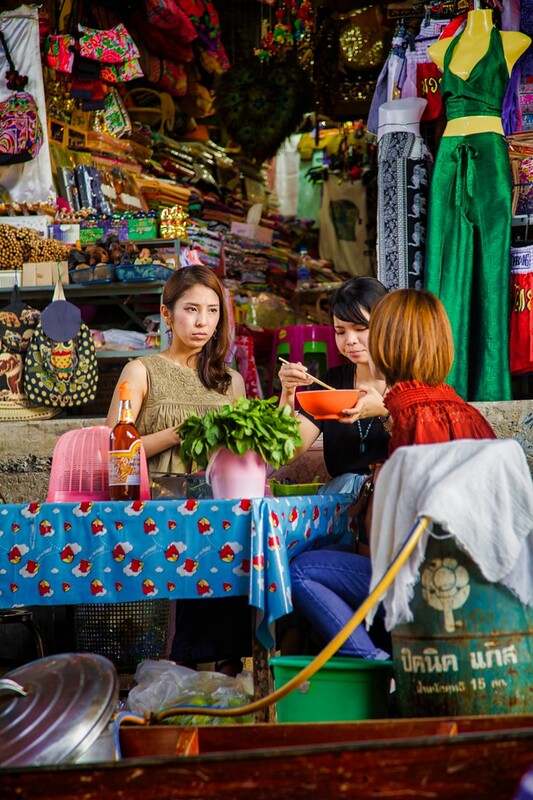 It just means more new experiences to try out when you visit Thailand again! I love your dress. Its so beautiful. May I know where did you get it ? Hi Joyce! It’s actually a flowy romper even though it looks like a dress and it’s from Zimmerman. They have it in several floral patterns, and the fabric is delicate and perfect for hot summer weathers.